Get on your bike quick and let the sunshine in! Oddly enough, the first day of spring is when, 'round these parts, spring went away again. Here too (SE Loisiana) High of 49* wind: west at 20mph. It was an indoor unsprung day. Oh, Darn! Then bundle up and stay warm! Robin Williams is my kind of guy! BTW - I love your profile pic, Julz! 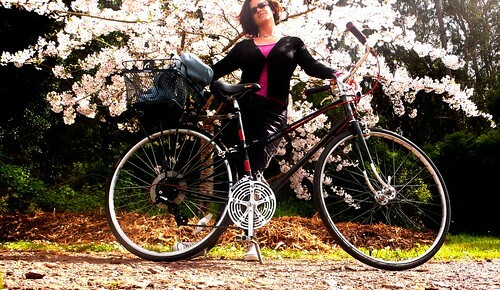 All the Blossom behind you is wonderful - as are you and your wheels! Spring is teasing London at the moment - boo.